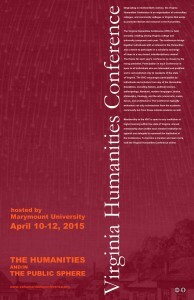 We are very pleased to announce that Marymount University is hosting the 2015 Virginia Humanities Conference this year, organized around the timely theme of “The Humanities and/in the Public Sphere.” Our keynote speaker, also the Bisson Lecturer in the Humanities, will be Dr. Steven Lubar, Professor of American Studies and former Director of the John Nicholas Brown Center for Public Humanities and Cultural Heritage at Brown University; he will speak on museum history, curation, and American culture. 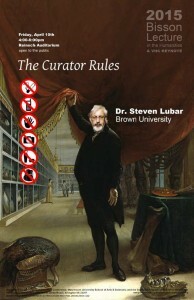 The conference will take place April 10-11, 2015 (with an optional outing on the morning of Sunday April 12, to the American History Museum). As you can see from this PDF program, we have a wide array of presenters and topics represented–and we hope you will join us! The Hilton Arlington Gateway has given the VHC an extraordinary conference rate, so we encourage you to make use of the code which will be available shortly!